SPresort was one of the levels that were sent to DNFInc's maps contest. It didn't won and I understand. Design is empty - there are no details and some of the textures are not so good. Map has no shadows - every area is quite bright and even those big areas hasn't got shadows at all. So why this map is here (it is said in 'Maps' section that only maps that has something special to offer can get there)? Gameplay design rocks. Map has some really nice effects like a moving space shuttle and nice explosions (you must run fast to avoid these). Map is very enjoyable to play even it has 'newbie' looking design. 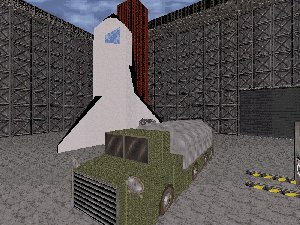 I think you will enjoy playing this map. Get it.